Annual day of entertainment, tradition, tribute & fundraising provides for the education of families of police & fire heroes who lost their lives in the line of duty. PHILADELPHIA, PA – (Monday, October 3, 2016) – It was a show of stellar support at the 62nd annual Hero Thrill Show, on Saturday, October 1st at the Wells Fargo Center parking lot in South Philadelphia. For the first time in the Hero Thrill Show’s glorious history, multiple Grand Marshals – all of whom were severely injured in the line of the duty – participated in this special day of tribute and tradition. Nearly 15,000 enthusiastically attended the daylong festivities, despite overcast skies. The Philadelphia Police Highway Patrol Motorcycle Drill Team made a roaring grand entrance into Lot “H” to give a sneak preview of its mesmerizing daredevil stunts that they will perform -- with even greater fanfare – later in the afternoon. The police motor-cade joined an impressive display of fire engines from units including Battalion 12/Engine 3/ Ladder 24. The event was hosted by Hero Thrill Show Inc. President/CEO James “Jimmy” Binns. City officials from the law-enforcement and firefighting communities as well as sports cheerleaders and mascots will be part of a program to kick off the day of activities. In addition to a stellar lineup of Grand Marshals, the show featured daredevil motorcycle acts, 92.5 XTU’s radio hosts Frank Lario and other local celebrities. The 2016 Hero Thrill Show raises funds from ticket sales and donations for the college educations of survivors of deceased police officers and firefighters who were killed in the line of duty. Binns said that all of the Thrill Show events recognize the heroism of our firefighters and police officers who sacrificed their lives for their communities. Binns is founder of the Hero Cop Plaque and Hero Firefighters Plague programs throughout the Delaware Valley as well as various initiatives to secure funding for police equipment and vehicles in the Delaware Valley. Binns is a Philadelphia attorney and motorcycle highway patrol officer in Darby Township, Delaware County. Joining Binns in an official noon kick-off ceremony were a host of guests and dignitaries City Representative Sheila Hess; Police Commissioner Richard Ross; Fire Commissioner Adam Thiel, Deputy Fire Commissioner Yolanda Stallings; Philadelphia Sheriff Jewell Williams; City Councilman Curtis Jones; Hero Thrill Show grand marshals; the families of police and firefighters who lost their lives in the line of duty; youth organizer and radio host Sonny Hill; the Highway Patrol Motorcycle Drill Team; the Philadelphia Police K-9 Unit; the mounted police patrol; representatives from the Fraternal Order of Police; International Association of Fire Fighters, Local 22 and many patrons of the City’s police and fire departments. The event began in spectacular fashion with a Philadelphia Fire Department ladder salute and motorcycle procession of Hero Thrill Show participants and the heralded Highway Patrol Motorcycle Drill Team, leading City Representative Hess in a side car -- followed by uniformed motorcycle officers from throughout the Delaware Valley. The program kicked off with the Pledge of Allegiance and National Anthem by Alberta Taliaferro, a relative of inspiring former Penn State football standout Adam Taliaferro. The grand entrance was followed by a program featuring remarks by City of Philadelphia officials and the introduction of the Hero Thrill Show’s unprecedented 11 Grand Marshals. Former and current Thrill Show beneficiaries and their families were be present and acknowledged in the kickoff ceremony. The students are furthering their educations through the assistance of full funding at mostly local colleges, universities and trade schools. Millions of dollars have been raised for the educations of at least 18 students from police and fire department families since the Hero Thrill Show was incorporated under the leadership of Binns in 2006. The kickoff segment set the stage for a day filled with exciting activities including a demonstrations and daredevil maneuvers, which begin at noon and continued throughout the action-packed afternoon. The Philadelphia Highway Patrol Motorcycle Drill Team, Mounted Patrol Unit and Police K-9 Unit led an all-star lineup. Following the kickoff program, all day long (from 1 p.m. to 5 p.m.), police and fire personnel performed spellbinding maneuvers and rescue procedures as well as presented educational demonstrations. The Hero Thrill Show highlighted a mix of the traditional and the new. In addition, this fall fund-raiser showcased displays of crime-fighting equipment by the Police Aviation Unit, Bomb Squad, the Crime Scene Investigation Unit, the Marine Unit, Firearms Instructors, Police Academy, S.W.A.T and U.S. Homeland Security. Audiences were impressed by performances featuring fire apparatus and safety demonstrations by the Philadelphia Fire Department’s Special Operations Units (Rescue 1 and Squads 47 & 72) and a live fire-suppression exhibition. Families engaged with the police and fire personnel, enjoying activities including an old-fashioned carnival with amusements, games, face-painting for the kids and the antics of Philly’s iconic team mascots. Youngers also learned about the finer points of policing and firefighting first-hand. CBS Radio Philadelphia – KYW Newsradio, SportsRadio 94 WIP, 98.1 WOGL, 92.5 WXTU, 96.5 AMP Radio and Talk Radio 1210 WPHT -- are proud supporters and media partners of the Hero Thrill Show. During a routine car stop, Philadelphia Police Officer Thomas Gibbons was struck by three bullets in the right arm, wrist and back in 1970. The gunfire nearly killed the 25 year-old Philadelphia police officer working for Philadelphia Police Highway Patrol. The officer’s ulnar bone was shattered. His partner, John Nolan, was shot in the head. Gibbons retired from the police as a result of his injuries. He became a reporter and covered the police for The Philadelphia Inquirer. He comes from a police family; his father, Thomas Sr., served as Philadelphia's police commissioner, from 1952 to 1960, and became known as a stern but fair leader who reformed the department. The younger Gibbons continues to write and speak about street violence and policing in the wake of national developments in police and community relations. Philadelphia Police Lt. Michael Mitchell was shot in the leg by alleged narcotics dealer following a drug buy to a fellow undercover officer in West Oak Lane in December 2005. Mitchell, then 41, and his partner were responding to a police back-up call in an unmarked car. The suspect was fatally wounded. Mitchell, a 17-year veteran, had transferred from Highway Patrol to the Narcotics Unit four days prior to the altercation. He comes from a family of Philadelphia Police officers including his father and uncle. Mitchell is married with grown children. Philadelphia Police Officer Richard Bowes was wounded after he arrived on motorcycle to back up fellow Highway Patrolman Patrick McDonald during a struggle in September 2008. The incident occurred following an earlier routine traffic stop in North Philadelphia. Officer McDonald, who responded initially, was shot and killed after the traffic stop before Bowes and two other officers confronted assailant Daniel Giddings, who was driving a stolen vehicle. During a chase in which Giddings shot Bowes in the leg, Bowes returned fire and fatally struck Giddings. Bowes’ pelvis was shattered. 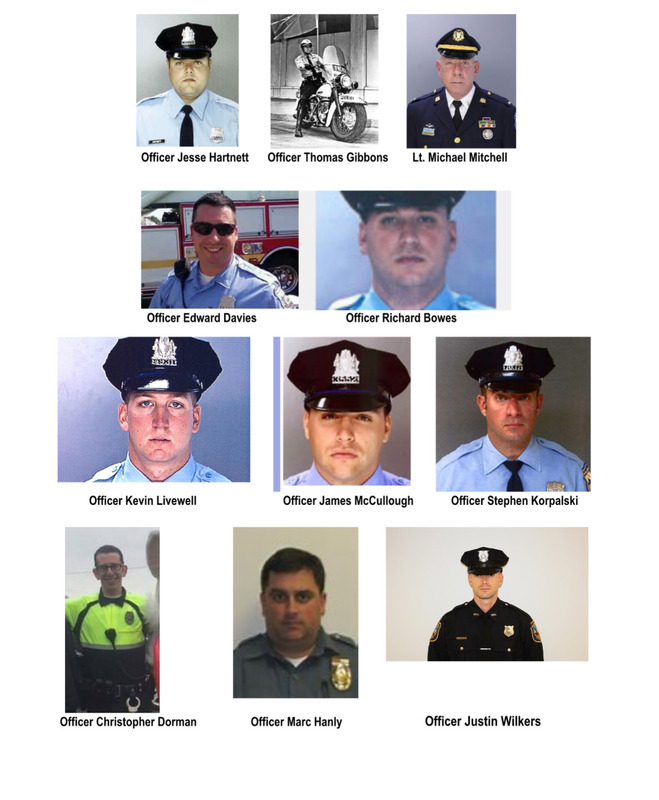 Bowes, 35 at the time, and McDonald were part of the Philadelphia Police Highway Patrol. Now retired and a resident of Northeast Philadelphia, Bowes was a 12-year veteran of the force and is married with three children. He earned the medal of valor, the highest honor for bravery on the police force. Last year, Bowes and his family were selected by the Archdiocese of Philadelphia to officially greet and welcome Pope Francis at the World Meeting of Families events in Philadelphia. Philadelphia Police Officer Kevin Livewell was shot in the leg in July 2010 after stopping a van loaded with an arsenal of heavy-duty firearms resulting in an exchange of gunfire. The shootout occurred after Livewell and Officer Brian Issel followed a white van in Kensington because it matched the description of a vehicle connected to a shooting earlier that day. Livewell, then 33 and a nine-year veteran of the force at the time, has recovered. His partner was uninjured. Livewell was assigned to the District Attorney's Office. The three attackers involved in the altercation were later sentenced to prison terms. Philadelphia Police Officer Edward Davies, of the 25th District in North Philadelphia, was wounded in August 2013 following a violent struggle inside a Feltonville corner mini market when he was shot in the stomach (below his ballistics vest) by an armed assailant. The gunman was fleeing a routine police stop by another officer a few blocks away. Davies’ kidney was punctured, severed an artery and underwent months of surgery. Davies, 41, was a six-year veteran and is married father of four children. The attacker was later captured. Wilmington Patrolman Justin Wilkers was wounded during an attempted traffic stop in the Southbridge section of Wilmington in February 2013. Wilkers, a three-year veteran, and another officer tried to pull over an SUV when the vehicle sped away, prompting a chase in which a gunman exited his vehicle and shot Wilkers in the face. Three men in the SUV were eventually arrested and charged. Wilkers, 34, is married with two children. He returned to active duty in the Wilmington Police Department seven months later, in August 2013, receiving a commendation for his actions. Philadelphia Police Officer Stephen Korpalski was shot in the head while trying to stop a man wielding a gun in the city’s Tacony section in August 2014. Korpalski, a 14- year veteran of the force, responded to a report of suspicious activity and was shot when he exited his police cruiser. He returned gunfire after being struck on the right side of the head. A back-up team of officers shot and killed the fleeing assailant nearby. Korpalski, of the 15th Police District, was married with a 3-week-old daughter at the time. Ridley Police Officer Marc Hanly was shot twice during a response to an apparent suicidal man in at an apartment complex in Norwood, Pa. in Delaware County in August 2015. The 14- year veteran was wounded in the leg and chest as he attempted to enter the property. He credits his bullet-proof vest with saving his life, as he returned from the hospital 12 hours after the incident. Has undergone intense physical therapy for his injuries. During a stand-off, the assailant was shot in the arm and captured on the scene. Hanly, 45, is a married father of two children and also serves as a chief in the Collingdale Fire Department. Philadelphia Police Officer Jesse Hartnett, 33, is a five-year veteran of the department. Hartnett, 33, survived an ambush while in his patrol car in West Philadelphia in January 2016. At close range, he was struck three times in the left arm before returning 13 shots on the assailant, striking the gunman. The shooter was captured by responding police officers a few blocks away. Hartnett suffered a broken arm and extensive nerve damage. He continues to recover and currently has limited use of his left arm after several surgeries. Hartnett has received many awards including the “Man of the Year” honors from the National Police Defense Foundation, a law-enforcement support organization. Hartnett works with police recruits relaying his experiences and has publically said he plans to volunteer more in the future. Philadelphia Police Officer James McCullough was shot in the leg in April 2016 trying to foil a car break-in attempt in West Philadelphia. A woman flagged down McCullough and his partner notifying that two men were breaking into her car. When the officers approached the vehicle, McCullough tackled one of the carjackers before being shot. McCullough managed to fire three shots at the fleeing suspects. McCullough, 24, was on the force for two years and engaged with a two year old daughter at the time. The suspects were later arrested. Folcroft Police Officer Christopher Dorman was shot repeatedly at point-blank range in Delaware County while responding to a report of potential drug activity in June 2016. Moments after arriving on the scene first, Dorman was shot seven times in the face, leg and chest. After a search, Folcroft police later arrested an armed man they called a career drug dealer for the shooting. Less than a week later, after two surgeries, Dorman, 25, was released from the hospital and immediately received a hero's welcome. His bullet proof vest was partially credited for his survival. In August, Dorman, the part-time first-year officer, was honored for his courage in the line of duty. Dorman and fellow Patrolman David DePietro received Commendations for Valor. Officials said DePietro was immediately fired upon arriving at the scene and returned fire, giving Dorman time to get to safety. Dorman is recovering and hopes to be back on duty in the near future. The City of Philadelphia including the Office of the City Representative, Managing Director’s Office, Office of Innovation and Technology, Department of Public Property, Police Department and Fire departments as well as the Heath Department will assist with the production of the event. The Hero Thrill Show Inc. is NOT affiliated with the Hero Scholarship Fund.